Set against the backdrop of the July 7th terrorist attacks in 2005, LONDON RIVER follows Elizabeth (BAFTA winner, Academy Award® nominee Brenda Blethyn) from a small farming community in Guernsey as she travels to London in the immediate aftermath of the bombings after failing to hear from her daughter. Elizabeth is disturbed by the confusion of the metropolis and above all, by the predominantly Muslim neighborhood where her daughter lived. Her fear and prejudice escalate when she discovers her daughter was converting to Islam as she keeps crossing paths with Ousmane (Berlin's Silver Bear winner, Sotigui Kouyaté), a West African who has come from France to find his missing son. Although they come from very different backgrounds, Elizabeth and Ousmane share the same hope of finding their children alive. Putting aside their cultural differences, they give each other the strength to continue the search and maintain their faith in humanity. 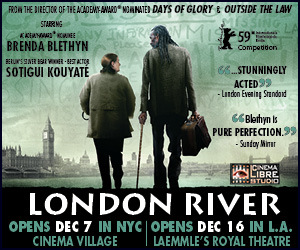 Help spread the word about LONDON RIVER - Add a banner to your site!